Daddy : Boys, who wants to see LEGO? Charles: Can we still play? The iconic Artscience Museum was the choice LEGO location. We were invited to play see The Art of Brick over the weekend. The boys are ardent fans of LEGO and were wide eye when told they will be going to a place to see LEGO. We were intrigued by the hand shape structure. Ques : Guess how many fingers does the hand has? Bet you do not know that! Back to The Art of the Brick exhibition. 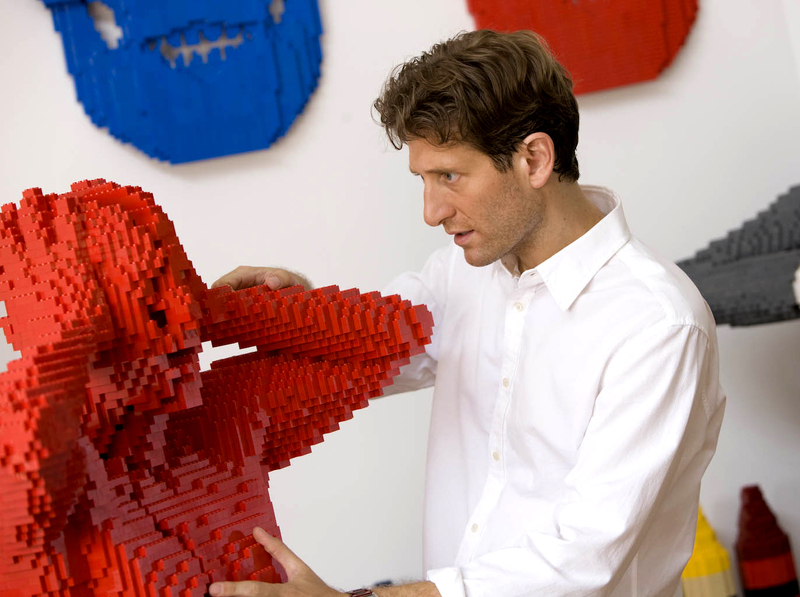 For the first time in Singapore, New York bases Nathan Sawaya will be showcasing his largest collection of 52 large-scale LEGO creations. This is deemed as one of CNN top 10 'Must see Global Exhibition". So when the invitation comes, we could not resist. A creation made up of 11014 bricks, it was created in 2006 to symbolise the metamorphosis of his journey. Somehow a Yellow man spilling his guts out has this mysterious attraction on both young and old. Next up is an Artist Studio made entirely of Lego Bricks! There are great photo opportunities within the exhibition. Flash photography is not allowed, but other than that, snap at will. I decided to model for one of his works as well. We stumbled upon a LEGO fashion show at the Catwalk hall. 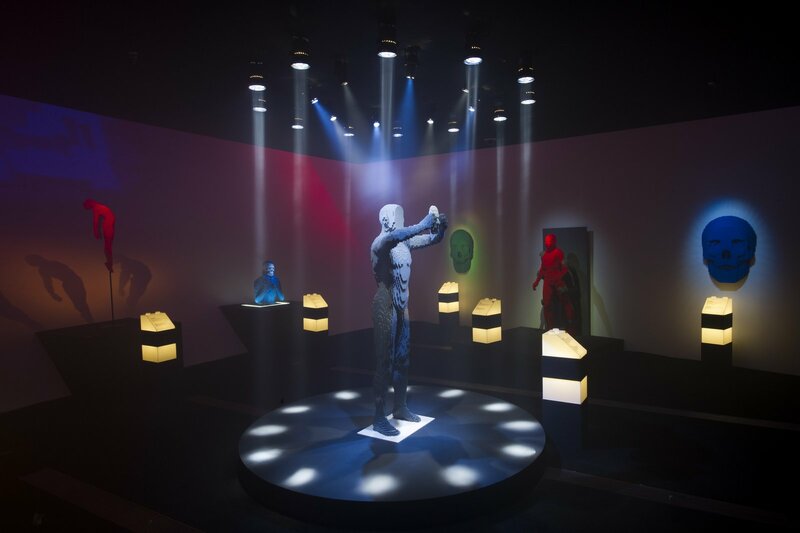 One of the thing we noticed is that Nathan Sawaya seems to specialised on human sculptures. 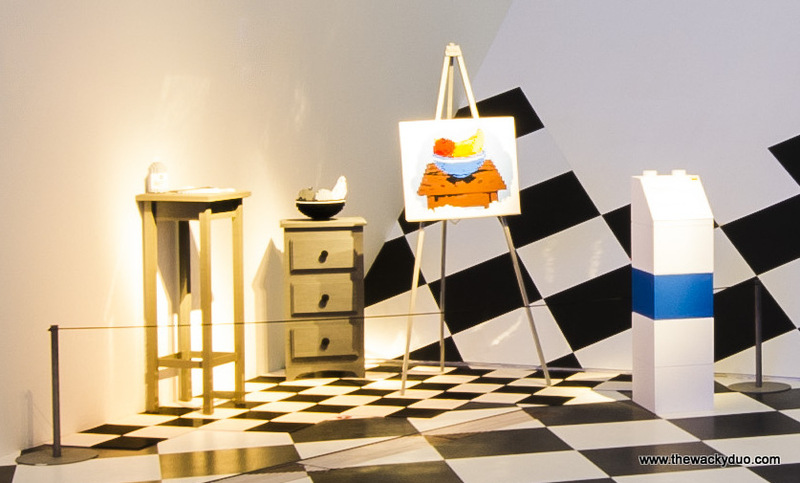 We were impress how he could bring emotions out from his artwork using LEGO bricks. You could almost feel the angst and the pain in some of his works. Only a true artist would be able to speak through their art. We were transported to The Portrait gallery where we see 3 dimensions bricks forming 2 dimensions work of art. Maybe we should commission a family portrait using LEGO. Can you identify the portraits? At the gallery, there is a photobooth for you to experiment with a self portrait using LEGO. There are a few other mini interactive stations within the exhibition that encourages visitors both young and old to experiment and 'play' in selected galleries. It's next to The Drawing Board, our next gallery. You will see related works that shows how to overcome difficulties and to be inspired by it. The next area that Daddy is most intrigued is The Emotion Box. This is an enclose area where you see bricks come alive through the skillful hands of the Brick Artist. Here you would witness different moods come alive via LEGO bricks. There is a raw wave of emotions peering though each individual works. On the other hand, we prefer the vastness of the next gallery. Here we see Nathan's largest work to date. The 20 foot long T-Rex that needs 80,000 lego to build. To give you a sense of how big this is , a Typical LEGO Box has about 200 pieces. That took Daddy about 3 hours to build. So an 80,000 piece T rex would most likely take months if not years to build..
For some reason, Didi decided to mimic a baby T Rex. I think he would like to be part of the exhibit. So is this exhibit suitable for kids? Perhaps the answer could be found from the Brick Artist himself. "It's art made out of a toy. Hopefully it inspires kids ( and maybe grown-ups too) to go home and make art themselves." 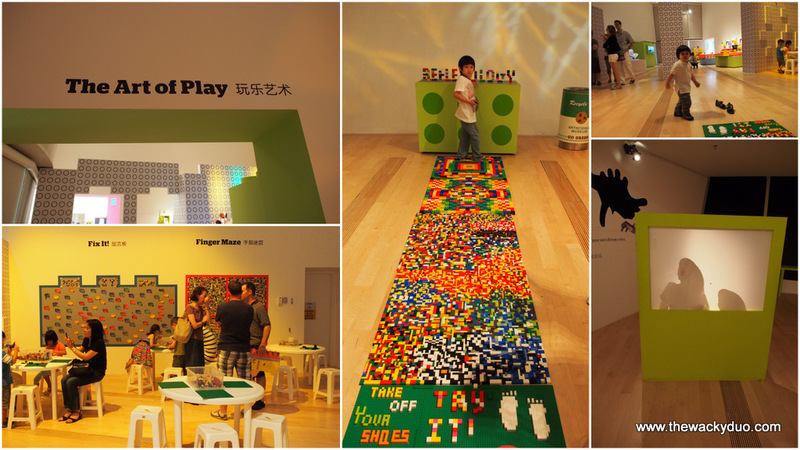 And if the adults need time to admire the works of arts, the kids can always be left to play at The Art of Play Gallery. There is a a reflexology path, a play and build area, a finger maze and a fix it Wall. The best day to visit the exhibit for kids would be Saturday where there will be free workshops at The Art of Play Gallery for kids such as stop-motion workshops(3pm-415pm) and playing with patterns (1230pm-2pm). Information of the workshops are avaliable here. In the meantime, I will be taking a nap at the reflexology path. There is also a gift shop at the end of the exhibit selling various LEGO related stuff as well as memorabilia from The Art of the Bricks. Daddy decided to pick up 2 large minifigs instead. He reckon that these 2 minifigs are the best looking ones to date. Daddy had a sneak peek at them during this trip. Here is a brief of what to expect. If you are of Fujian origin ( i.e.Hokkien) , you may be interested to explore the roots of Fujian history. 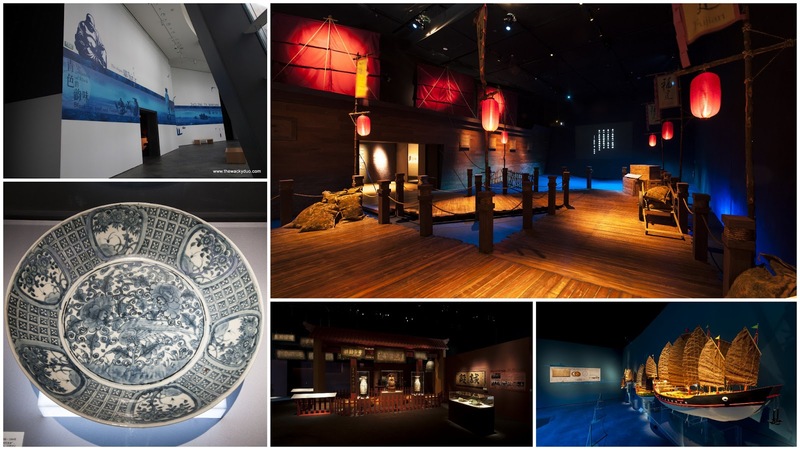 Follow the seafaring journey of the Fujian people as they traveled from China and settled down in Southeast Asia in 1800s. This exhibit is great for Daddy as he is able to learn and admire the ingenuity of his forefathers. Featuring 143 works by three renowed photographers ; Mark Powers, Stuart Franklin and Jacob Aue Sobol from the prestigious agency , Magnum Photos. There are free workshops on selected days such as Photolab, Artscience of photography workshops and darkroom developments conducted. For more information, please refer here. Daddy would recommend families with younger kids to explore The Art of Bricks. The other 2 exhibits would have less appeal to younger kids due to it's contents and themes. A special thanks to Marina Bay Sands and Marina Bay for an afternoon of Arts and Fun! 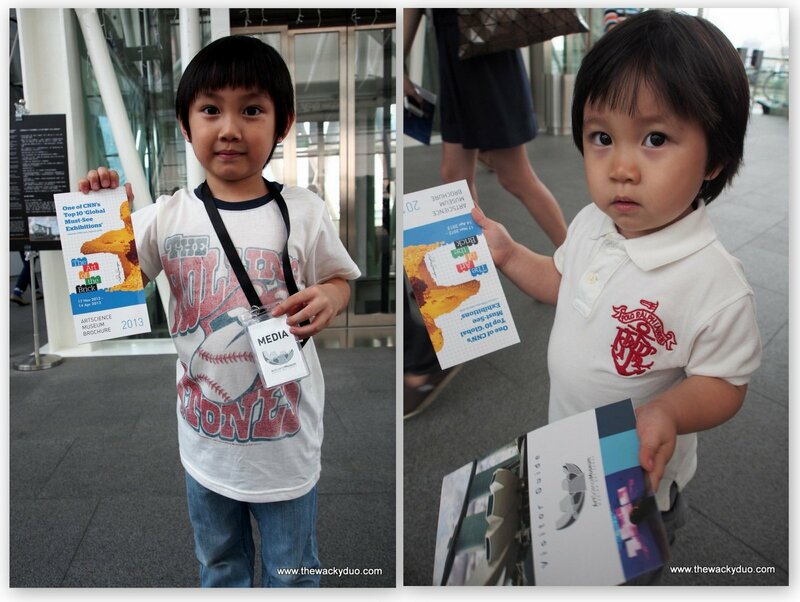 The Wacky Duo were given complimentary entrance to review the exhibits are Artscience Museum. No monetary rewards were received and all opinions believe it or not are 100% our own.